AM Palmer assumed control of Wallack's Theatre in 1888 and tried to establish another stock company based there. He produced plays in New York through 1896. Arthur Hornblow, theatre historian and the manager's assistant play reader (1892-1894) thought Alabama (1891-1892) was the high-water mark of Palmer's managerial success. "After that he lost ground rapidly and never regained it". In March 1891 EJ Phillips wrote to Albert that she was playing in the Pharisee next week at the Madison Square. This week at Palmers in Wealth "a very bad part indeed." 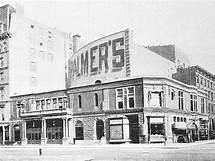 Odell reports that on Nov 2, 1891 Palmer "brought to this stage the splendid stock company which we had admired for so many years at the Madison Square Theatre. We remember that, after his successful seasons there with Jim the Penman, Captain Swift and Aunt Jack, the season of 1890-1891 had been for the manager almost disastrous, till, toward it s close Augustus Thomas's charming play Alabama brought a return of prosperity which he was forced to cut short because of previous engagements. He now signalised the passing from the former theatre to the new with a revival of the Thomas comedy, and with Sarah Bernhardt in the first-night audience. "A faithful follower of the Palmer company, I [Odell] attended one of their earliest performances of Alabama in their newer home. The reader knows that the lovely comedy lost something in its journey six blocks northward to the larger house. A sense of intimacy, possible and delightful in the Madison Square Theatre, could never be attained at Palmer's; even the Wallack company had never seemed so near and dear at Thirtieth Street as at Thirteenth Street. The fact is that no one ever felt quite at home in the house just across Broadway from Daly's cozy drawing room auditorium. It seemed larger than it really was; and I always felt that I must strain to arrive, in imagination, among the actors on the stage. In December 1891 Palmer produced Margaret Fleming by James A. Herne, advertised as "never before seen on the stage of a theatre" (though actually it had been acted in Lynn and Boston). Odell notes that the Herald review found the play "monotonous and talky" and suggests that it was like "certain Ibsen dramas, more stimulating to read than to see in action on the stage." Jim the Penman was revived in Jan 1892. In Feb. Palmer produced Sydney Grundy's Broken Seal. Palmer's season opened on Oct. 3, 1892 with John Drew (so long a leading man at Daly's) in The Masked Ball ("an amusing, if non-essential farce" according to Odell). This ran until Charles Frohman brought in Bronson Howard's Aristocracy on Nov. 14th. Odell, George Clinton Densmore, Annals of the New York Stage, New York : Columbia University Press, 1927. Strang, Lewis C., Players and Plays of the Last Quarter Century, Boston : L. C. Page & Co., 1902. 1891 1 20 New York NY Palmers Theatre rehearsals of new play tomorrow Social Fiction? 1891 3 22 New York NY Palmer's Theatre Dinner at Eight curtain raiser Death of Lawrence Barrett "ambitious struggles at an end"
1891 11 10 New York NY Palmer's Theatre Middleman EJP not in Mrs Chandler?